I watched the Coen brothers’ masterful version of True Grit the other night, and the remarkable dialog got me thinking about the man who wrote most of it: Charles Portis of Little Rock, Ark. And that got me thinking about a book of his that I hadn’t yet read: a thin volume called Norwood. The next day I went to Chamblin Bookmine here in Jacksonville to wander the labyrinthine aisles in search of it. 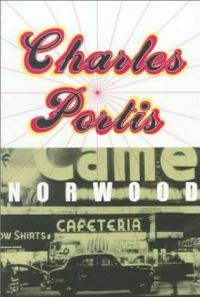 Chamblin’s has about a million books, but they had only one well-used copy of Norwood left, and it looked to be the only Portis title in the place. Then again, the Chamblin filing system seems a bit capricious, so I may have missed the mother lode. Norwood is a quintessentially American novel, a road yarn where nothing much happens and yet everything does, and at the end of it you feel like you’ve run across some people you used to know and roads you used to travel. It’s also a pretty funny book, in that subtle way where the humor comes from the characters living their lives, instead of the writer making them dance. So much imagery in a single sentence. But that’s the genius of Charles Portis. Back to True Grit: As good as the cast is, and as good as the Coens are as filmmakers, what they’ve done with this movie is let the author’s voice come through as it didn’t in the John Wayne version. In the words they speak, each character lives and breathes; each struggles in a cruel and imperfect world where morality is subjective and all anyone can do is the best they know how. The difference is that some know how better than others. Without veering further into hyperbole, I will say that this True Grit is probably the best Western ever made. Norwood may not be the best novel ever written, but it’s a true gem. I’m sorry I didn’t get to it before now. If you come across it in a bookstore or library near you, check it out.